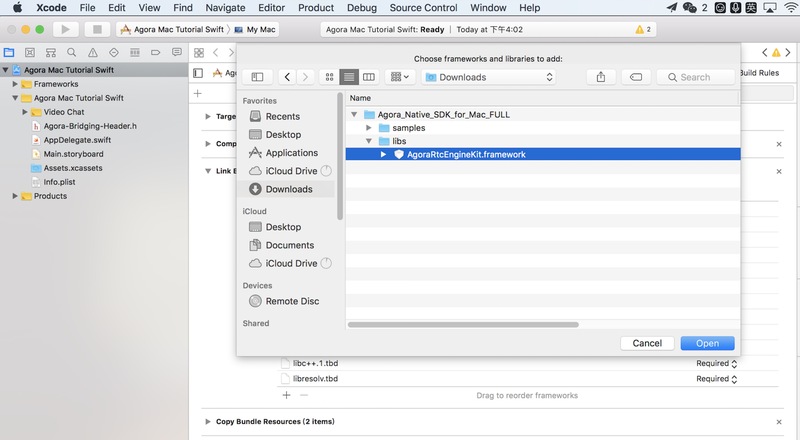 This page contains information on how to prepare the development environment before enabling a call/live broadcast with the Agora SDK for macOS. Ensure that your project has a validated provisioning profile certificate. Use a physical device to run the sample. Emulators may lack the functionality or the performance needed to run the sample. Adding the Libraries Automatically: Add the libraries automatically using CocoaPods. You do not need to download the SDK. Adding the Libraries Manually: Download the SDK and add the libraries manually. Skip this step if you have preconfigured CocoaPods and Homebrew on your system. If you see -bash: brew: command not found in Terminal, install Homebrew before running the command. See Homebrew Installation Method. Create a Podfile in your project. In the root directory of your project, run the following command in Terminal. This creates a Podfile in the same directory. Add the Agora SDK reference in the Podfile. Open the Podfile, and put in the following content. Fill “Your App” with the name of your Target. If you see Pod installation complete! in Terminal, you have successfully added the libraries. Click to open the YourApp.xcworkspace file, or run the following command to open it. Fill “YourApp” with the name of your Target. Download the Agora Video SDK for macOS and unzip the downloaded SDK package. Open your project with Xcode and select the current Target. Navigate to the Build Phases tab. Expand the Link Binary with Libraries section to add the following libraries. To begin adding the new libraries, click the + button. AgoraRtcEngineKit.framework is in the libs folder of the downloaded SDK. Click + > Add Other…, go to the downloaded SDK, and add AgoraRtcEngineKit.framework. Privacy - Microphone Usage Description, and add a note in the Value column. Privacy - Camera Usage Description, and add a note in the Value column. You can access the added library using Objective-C or Swift. In the main file that uses the Agora APIs, add #import <AgoraRtcEngineKit/AgoraRtcEngineKit.h>. The SDK provides FAT image libraries with multi-architecture support for both 32/64-bit audio emulators and 32/64-bit audio/video real devices. In the main file that uses the Agora APIs, add import AgoraRtcEngineKit.